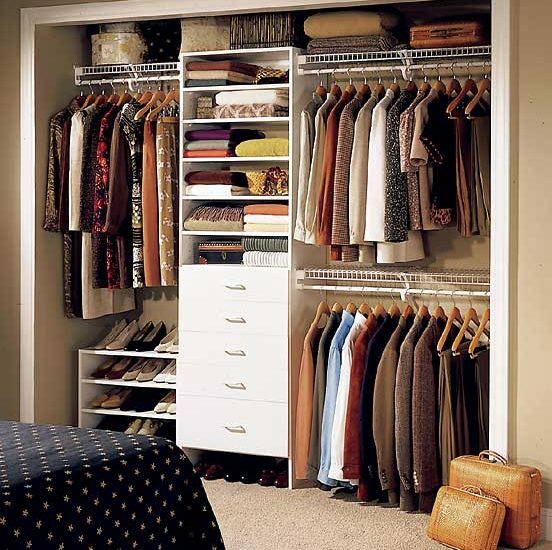 In the following, you’ll find a dozen clever organizational considerations for your home closet. These consist of creative layouts, unique arrangement solutions and the tricks of the trade when it comes to optimal organization. Mirrors make spaces look bigger; in additional to their usual utility. Use a power drill and plastic to install a hook in the wall of the closet directly facing you; you might as well add hooks for a jewelry and handbag storage area, too. Laundry baskets can have many uses – why not consider them as storage? After all, they already function to store both dirty clothes and laundered clothing; you can create an attractive storage area in the laundry room for your shoes and handbags. The primary benefit of this is the low cost of the setup. Before you create a separate storage area and use coat hangers accentuate it, make sure you’re using all the available space in your actual closet, first. By adding extra shelves, you can take advantage of the otherwise empty space between the end of your hanging shirts and your shoes on the ground. Much like retail stores aim to have every space on their rack and stack storage shelves, you should aim to fill all of the available space in your wardrobe. 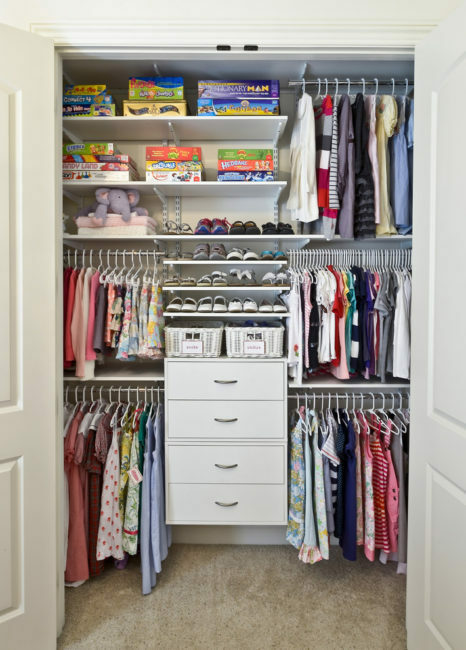 This is especially useful if you have children; their closet can hold a surprising number of their smaller clothes and shoes once you’ve got a pegboard installed in the back. Colorful bins could hold their toys, too. more closet space is a must have . Expanding the closet would probably be costly. Thank you for the tips. My closet is always in a mess. I have clothes in my closet that I never wear. I totally need to organize my closet, and I plan to do this when school starts for the kids. I like the idea of a laundry basket drawer system. I really like the multiple hanging levels idea. That doubles your hanging space. Wow, I wish my closet looked like the one in the picture. When we built our home, we had the walk-in closet extended to have more space. I need to organize whats in it now to better make use of the extra space. I love the multiple hanging levels. I now need to put some of the tips to use. Thank you for the great ideas. I wish my closet looked like the one in the picture. The problem is I rent my place. I don’t think that they would allow this.